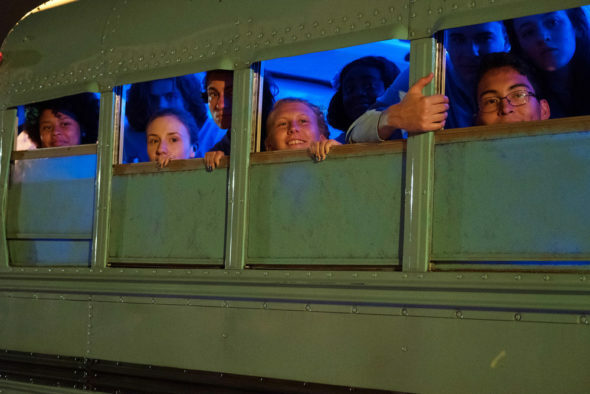 The Purge: Cancelled or Renewed for Season Two on USA Network? Has this series been purged from the airwaves? Is The Purge TV show cancelled or renewed for a second season on USA Network? The television vulture is watching all the latest cancellation and renewal news, so this page is the place to track the status of The Purge, season two. Bookmark it, or subscribe for the latest updates. Remember, the television vulture is watching your shows. Are you? A USA Network horror series, The Purge stars Gabriel Chavarria, Jessica Garza, Hannah Emily Anderson, Colin Woodell, Reed Diamond, Lili Simmons, William Baldwin, Lee Tergesen, Paulina Gálvez, Allison King, Fiona Dourif, and Amanda Warren. From creator James DeMonaco, and based on his feature film franchise, the drama unfolds in the United States, which is under totalitarian rule. The story centers on a 12-hour period during which all crimes, including murder, are legal. The first season of The Purge averaged a 0.41 rating in the 18-49 demographic and 1.07 million viewers. Check out how The Purge stacks up against other USA Network TV shows. The Purge has been renewed for a second season which will debut TBD. Stay tuned for further updates. Will USA Network cancel or renew The Purge for season two? The show premiered with solid ratings and, though they’ve dropped, The Purge remains one of their highest-rated series. I think it will be renewed. I’ll keep an eye on the ratings and update this page with breaking developments. Subscribe for free alerts on The Purge cancellation or renewal news. 11/6/18 update: USA has renewed The Purge TV show for a second season. Details here. Find more of The Purge TV series news or other USA Network TV show news. What do you think? Are you happy that The Purge TV show has been renewed for a second season? How would you feel if USA Network had cancelled this TV series, instead? According to USA channel there will be a second season.